We're in NY. 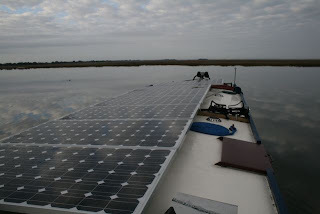 Boat is back in Charleston, makin' watts. 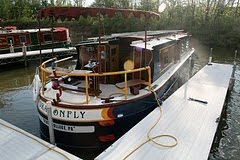 The Dragonfly is docked in Charleston this week; the crew is in Upstate NY visiting Cap's folks. We lugged our broken flex coupler with us on the plane, and Monday we drove up to Macedon, NY and our home port on the Erie Canal, Mid-Lakes Navigation, where joy of joys, we picked up a replacement. It was surreal to be transported so quickly to the place our adventure started last June--the place we're spent 8 months sloowwwwly traveling AWAY from. We said hello to the other canal boats, hauled out on shore and propped on stilts and wrapped in plastic against the winter ice, and laughed about Cap's weekend adventures this time last winter, climbing up a ladder through the snow and ice to work on the boat. His first trip to Macedon, the local police pulled up just as he was crawling headfirst through the plastic cocoon. Good thing he had ID and the bill of sale. Speaking of the Erie Canal, big doin's here in the world of solar boats! The Tamarack Electric Boat Company is setting up shop in Rome and, come May, will start building solar-powered boats. Financing for the project includes half-a-mil from the New York State Energy Research and Development Authority. Tamarack President Monte Gisborne, a Canadian who has also converted his snowmobile and home garden tractor to solar power, made a bit of a media splash when he cruised the Erie Canal in his prototype boat, the Loon, back in 2007. Loon is a pontoon-style boat with solar panels on its canopy; it won an award at the "Future of Electric Vehicles" conference in San Jose this year. Loon travels about 4 to 6 mph--just like Dragonfly. That's perfect for day trippers trolling for perch. But slow boats aren't for everyone. During our travels we've given hundreds--no, probably thousands--of people a tour of SlowBoat, and though everyone makes admiring remarks, sometimes you overhear a guy whisper to his spouse, "I could NEVER travel like this!" If that's not luxurious enough for ya, Rolls-Royce has an electric prototype based on the Phantom.